We’d love your help. Let us know what’s wrong with this preview of Early Riser by Jasper Fforde. Your name is Charlie Worthing and it's your first season with the Winter Consuls, the committed but mild The new standalone novel from Number 1 bestselling author Jasper Fforde. To ask other readers questions about Early Riser, please sign up. This answer contains spoilers… (view spoiler)[ I'm right there with you. Started reading it assuming that Charlie was female, but then slowly wondered if Charlie might actually be a guy. But then…more I'm right there with you. Started reading it assuming that Charlie was female, but then slowly wondered if Charlie might actually be a guy. But then started to notice that in every conversation, Charlie is always referred to by others as Charlie, Worthing, Novice, Wonky, Consul, or something else other than a clearly gendered pronoun. Is this novel written in second person POV, or is that just a quirky blurb choice? Jennifer Just a quirky blurb choice - the novel is in first person. Jasper Fforde is one of those writers that defies genre conventions, and even within his own body of work, he's written some books that won't have cross-over appeal. The Tuesday Next series, for instance, is pure fantasy silliness, based on the premise that there is a book/media world that becomes a live-action play whenever a book is read. The Nursery Rhyme series--my favorite--is equally silly, revolving around a detective solving crimes related to Humpty Dumpty and The Three Bears. Fforde's p Jasper Fforde is one of those writers that defies genre conventions, and even within his own body of work, he's written some books that won't have cross-over appeal. The Tuesday Next series, for instance, is pure fantasy silliness, based on the premise that there is a book/media world that becomes a live-action play whenever a book is read. The Nursery Rhyme series--my favorite--is equally silly, revolving around a detective solving crimes related to Humpty Dumpty and The Three Bears. Fforde's pushed boundaries even further in the past few years with Shades of Grey and his latest stand-alone, Early Riser. I'd be hard-pressed to categorize it as either sci-fi or fantasy, as he does seem to take some pains to make his world semi-explicable according to Earth-laws, but at the end of the day, it's typical Fforde weirdness. The set-up is a world that swings dramatically from frigid Winter to a normal Summer, requiring the majority of inhabitants to hibernate in Domiciles during the Winter months. It's a super-intriguing premise reminding me of Hugh Howery's silos in Wool, but really, that's not Fforde's point, and there are mostly just intriguing but limited details on how the society operates. There's a young person who becomes a member of the Winter Counsul, the group that sacrifices health to stay up and maintain order during the lean winter months. A supposedly quick mission of turning in a brain-dead 'sleeper' takes him and his preceptor Logan to the outlying and wild Sector Twelve, and unusual circumstances progress as they start to hear rumors of a 'viral dream' causing those who can't hibernate to go crazy. It's a genre-bender to be sure. Sci-fi, fantasy, dreamscape fiction, apocalypse, mystery, coming-of-age; it draws elements from all. This is a book where--you may laugh--you need to read all the words if you want to enjoy it. (I don't always, especially with 'meh' level books). It was engrossing and consuming, and took a little work to read. There's very little background or exposition, and what is there may not matter again. For instance, the story opens at the place Charlie Worthington resides, a sort of orphanage/baby-making nunnery. Does it matter? Only in context of his beginning, and perhaps in assumptions others might make about him later on. But you have to be able to go with the reading flow, content to understand as much as Fforde gives and possibly extrapolate the rest if you are going to enjoy it. Definitely less silly than Fforde's earlier books, which isn't to say it is without humor, both incidental and situational. It took me awhile, but there's a running joke about how awful various attempts at making 'coffee' on limited supplies are. There's also a cute running gag where two characters meet and one is invested in imagining a shared history that is both funny and a little sad. As usual, Fforde has quite a bit to say about capitalism. There's some side bits about the English and Welsh relationships as well. Thankfully, no cheese. I found it a satisfying read, but fairly sure it isn't one that will make it into my library (unlike The Nursery Crimes) Cross-recommendation: The Gone-Away World. Also feels a little similar to China Miéville in general boundary-pushing. Jasper Fforde is one of my favourite authors and I have been waiting it seems for ages for him to write something new! Here it is at last and it is worth every minute of the wait. This new book is written in Fforde's typical quirky and inventive style. The setting is an alternate Wales where the population hibernates through Ice Age like winters and only a few people stay awake to take care of the sleepers. Our hero, Charlie, becomes a Winter Consul and this story tells of his first winter spent Jasper Fforde is one of my favourite authors and I have been waiting it seems for ages for him to write something new! Here it is at last and it is worth every minute of the wait. This new book is written in Fforde's typical quirky and inventive style. The setting is an alternate Wales where the population hibernates through Ice Age like winters and only a few people stay awake to take care of the sleepers. Our hero, Charlie, becomes a Winter Consul and this story tells of his first winter spent awake with mostly rogues and thieves for company. I love this author's writing style. It is smart and witty and there are lots of little topical references which are always slightly askew like "...knowing all the old Nesbits was like knowing every actor who ever played Jane Bond, especially the solitary male one, something which was quite controversial at the time." Food also is very important in a world of snow and ice and I enjoyed all the references to things like Nesquik and Jaffa Cakes, things from my English childhood! Zip up your snowsuit and grab your pillow and blanket! It’s time for a chilling, sharply funny novel, where humans hibernate half the year, and dreaming can be deadly. Welcome to the delightfully zany world of Jasper Fforde! Charlie Worthing is a new recruit with the Winter Consuls, the scrappy agency that watches over the lucky tranche of humanity that gets to hibernate through each brutal winter instead of risking frozen limbs, starvation, and death. What’s his first day on the job like? Well, his mentor is immediately assassinated, a viral dream is killing off hibernators, and that’s just the beginning. Throw in cannibalistic Nightwalkers, the dreaded WinterVolk people, and the other undesirables he must deal with while being awake, and you’ve got all the makings of a very fun adventure story. Can Charlie save the day? I’m trying hard not to gush here, but I have been a diehard Jasper Fforde fan since his first novel, and this one makes me SO HAPPY! Fforde has such an incredible talent for witty dialogue, and the imagination he pours into this novel is astounding. I loved how the exposition builds and builds, gaining momentum like a runaway snowball, until its fabulous conclusion. Whether you’re a longtime fan or a first-time Fforde reader, this novel is ffun for everyone! Jasper Fforde hasn't released a new book since 2014, and that is a long time for him. I have been waiting and waiting (so patiently) for the third Nursery Crime book, but it just doesn't seem to be happening. Neither does the second Shades of Grey book. But now there is this book, which is not actually out in the US until 2019, so I bought it from Book Depository. I'm glad I did this anyway because the UK cover is so much better than the American one. It has a cutout cover and when you lift it u Jasper Fforde hasn't released a new book since 2014, and that is a long time for him. I have been waiting and waiting (so patiently) for the third Nursery Crime book, but it just doesn't seem to be happening. Neither does the second Shades of Grey book. But now there is this book, which is not actually out in the US until 2019, so I bought it from Book Depository. I'm glad I did this anyway because the UK cover is so much better than the American one. It has a cutout cover and when you lift it up those people are on the beach, and I just love it. But, okay, the actual book. What Early Riser reminds me of the most in tone and style, if you've read his other books, is actually Shades of Grey (which was subtitled The Road to High Saffron after they decided it would, eventually, have sequels; but my copy just says Shades of Grey on it). It has a completely original world that can be a bit dense to get in to, and the satire functions in almost exactly the same way. Fforde builds a world that is so ridiculous and implausible that his characters' actions reflect the absurdity of our own society and behavior. Early Riser is set in a world where winters are so severe that humanity has chosen to hibernate every year. Everything is built on this premise: their social structures, their reproduction, their body image, etc. And almost everything is completely upside down from our world. Because if you don't have enough body fat, there's a high chance you won't make it through the winter, attractive people are those who are fatter, and skinny people are seen as undesirable. Larger bodies are seen as signs of wealth and stability (much as it was in the middle ages). There is a constant threat of population decline, and a high chance of not lasting the winter, either because you never wake up, you wake up wrong, or mysterious monster figures get you. As in other Jasper Fforde satires, there are also nefarious corporations, conspiracies, and absurdities abounding. But this book is actually the darkest thing I've read from him. Its humor is definitely humorous, but it's a darker, bleaker humor. Our main character is Charlie Worthing, a somewhat hapless young man who blunders his way through a lot of things. He's decided to become a Winter Consul, one of the select few humans who stay awake all winter, caring for the sleeping others. It's a very dangerous job, most newbies not making through their first winter, and he basically only takes it out of spite. He has no idea what he's doing. As a result, his POV isn't the most helpful in decoding Fforde's world, because any clues dropped we as readers have to put together. Charlie ain't going to do it. As other reviewers have noted, the barrier to entry on this one is pretty high, even higher than most of his books, as there is such a lot of worldbuilding and terminology to understand. You do eventually get it all (took me about 1/4 of the book), but it takes longer than it should. I don't think I've ever read a Fforde book I haven't enjoyed, but this one, though the premise is incredibly intriguing, isn't my favorite of his. The complications take away a bit of the enjoyment. Still, on re-read, I bet I would like it a lot better. It would also make for a fantastically creepy and funny movie. Nobody has yet been able to successfully translate Fforde into film yet, so I guess I'll be waiting a while on that. Early Riser is the fourteenth novel by Welsh author, Jasper Fforde. Twenty-two-year-old Charlie Worthing gladly deserts his Assistant House Manager job at St Granata’s Pooled Parentage Station in Cardiff when the opportunity to become a Winter Consul presents. With a bare minimum of training, he starts as the new Novice for the famous Jack Logan. With Slumberdown (for Winter) mere days away, their first assignment is, ostensibly, to deliver a Night Walker to the Hiber-Tech HQ in the often-danger Early Riser is the fourteenth novel by Welsh author, Jasper Fforde. Twenty-two-year-old Charlie Worthing gladly deserts his Assistant House Manager job at St Granata’s Pooled Parentage Station in Cardiff when the opportunity to become a Winter Consul presents. With a bare minimum of training, he starts as the new Novice for the famous Jack Logan. With Slumberdown (for Winter) mere days away, their first assignment is, ostensibly, to deliver a Night Walker to the Hiber-Tech HQ in the often-dangerous Sector Twelve. He’s already not doing too well at this when his mentor is killed, and Charlie has to make the delivery on his own. He also intends to fulfil Logan’s intention to speak to the Sector Chief Consul about the recently reported spate of viral dreams involving a blue Buick, an oak tree, boulders and grabbing hands, and ending in psychotic episodes. Accidentally(?) stranded in the Sector, Charlie wakes up to realise that he, too, has had this dream. The world that Fforde builds is certainly different. This is Wales, but not as we know it: it gets very cold in Winter; a mere 0.01% of the population (Winter Consuls, winsomniacs, Villains, Wintervolk and the mythical Gronk) does not spend the eight months of Winter in Hibernation; everyone spends the eight weeks before Slumberdown prodigiously eating, putting on enough weight to see them through; the lucky ones get to use Morphenox which stops them spending their energy reserves by dreaming; population numbers reduce each winter because of the cold, so there is compulsory child-bearing legislation. His fourteenth novel bears all the usual Jasper Fforde trademarks: amusing names (of people, organisations, publications, drugs); chapters prefaced by quotes from (sometimes bizarrely titled but always relevant) books, articles, press releases, a dictionary, magazines and, of course, from many of the ten editions of the Handbook of Winterology (Hodder & Stoughton); numerous footnotes that are occasionally humorous but always informative and therefore, ignored at the reader’s peril. The start - a bit indifferent. This is a new standalone story from an author I am a real fan of. In practice he has written nothing for some years now and I was a little worried and pleased when I got my review copy. This is set in Wales though not the Wales we know. In this story we are loosely in the current era however Wales enjoys temperatures in the winter that can descend to lower than -50 degrees. In the main inhabitants hibernate and have done so for years. A few people do stay awake. The Winter Consuls are one group who keep order over that period. The Hibertech corporation also works through the winter. The other humans awake are largely unfortunates or criminals - in either case food is very important to them. Cue the arrival of Charlie. Charlie is an orphan of sorts and desperate to leave the institution he is in. He joins the Winter Consuls as a novice. Novices lives tend to be short and the first winter takes a toll. It's bizarre and is very Jasper Fforde. While this is wildly inventive it does take some scene/world setting. This seemed to slow down the first third or so for me quite a bit. Charlie's first "simple" job does not go well and he is stranded in Sector 12, loosely mid Wales, which has a bad reputation for all kinds of things. In particular it appears that a viral dream make be killing people off It is also a centre for the Hibertech corporation. Fforde has a penchant for manipulative, shady corporations and this is no exception. Throw in the Womads and Wintervolk and almost anything could happen. Charlie - or Wonky as he prefers NOT to be known - finds himself in the centre of everything that is going on. As far as the key components are concerned there is great humour here and the characters are rich and interesting. Aurora and Toccata are wonderful creations for example. Charlie too is excellent. Charlie actually has a feel of Eddie in Shades of Grey for me (although it is a while ago I read it). Maybe the basic outline has some similarities too - state/corporations plots to do what? The writing is very effective; simple in some senses and yet complex enough to be interesting. I did find it is best if the reading can be sustained. For me this is definitely not Fforde's best work. As I said the first part of the book seemed rather slow. The book became progressively faster, clearer and more appealing as time went on. The graph of my enjoyment went up and up as the temperature went down and down! Ultimately it was great to read a new book by Jasper Fforde and I enjoyed it. I sincerely hope that he can now add to Shades of Grey because that first book is probably one of my all time favourites - more please Mr Fforde! I’m being more kind with this book than my last couple. In truth I think it’s probably a 3.5 Star read. Not as meh as 3 stars, but not as great as a 4 Star read. In the beginning, the reader is just dumped into this bizarre world where humans hibernate and have winter coats and “bulk up” for winter. It takes a long time for all the pieces to come together and get the hang of it, but on the bright side, there aren’t many info dumps. I loved all the humor. There were a couple parts that had me laugh I’m being more kind with this book than my last couple. In truth I think it’s probably a 3.5 Star read. Not as meh as 3 stars, but not as great as a 4 Star read. I loved all the humor. There were a couple parts that had me laughing out loud. The intrigue takes a while to pull the reader in, but otherwise it was a pretty quick and easy read. It was a little predictable in terms of the whodunnit, but I think there were enough twists and turns added in to the journey to make it feel unpredictable. Thinking back on the plot I feel like there were a couple plot threads that didn’t contribute much to the overall story, but they provided a little comic relief. If I could change something about it I think I’d make the world building a little clearer. There’s talk about child bearing responsibilities- I would have liked to know more about why this was necessary? Winter is a killer, okay- but how many people are dying that they need to force child bearing duties upon people? I get that there is a higher rate of death among over winterers, but we aren’t given many stats about how many people aren’t surviving due to straight up starvation. The given (and inconsistent stats) don’t add up to making this a necessary requirement. I was also very unclear on the time line. The latest reference I found was to something in 2003, but some references go back to the 19th century. The technology didn’t seem super advanced, but some of it also wasn’t familiar. The other thing I will say is that I think it would have made a fantastic horror novel. The setting was great. Sector 12 was creepy and eerie. The myths and legends about wintervolk added to the horror vibes, but it never went full throttle. Nothing about it is truly scary but it could have been, so it ended up feel like missed potential. All in all, not a bad read. I might check out other work by Fforde in the future. Sarah Vicki wrote: "Thats a great review, it basically answered questions I have about reading it. I'll probably save it for when my bookclub takes a break. Vicki wrote: "Thats a great review, it basically answered questions I have about reading it. I'll probably save it for when my bookclub takes a break." Jess If you liked this Fforde, you should check out Shades of Grey. There will supposedly be a sequel, but no date yet. It is good as a standalone as well. No one who got cold and dirty in the Winter was ever truly welcome in the Summer. The citizenry didn't know or care what the Consuls did during the cold to keep them safe, they just wanted to wake alive in the Spring, same as always. For many people, the Winter didn't really exist except in an abstract sort of way, and by consequence, neither did we. Jasper Fforde writes books that are a dream to read, and a nightmare to review, but here goes! It's been a long wait for this one - over two years s No one who got cold and dirty in the Winter was ever truly welcome in the Summer. The citizenry didn't know or care what the Consuls did during the cold to keep them safe, they just wanted to wake alive in the Spring, same as always. For many people, the Winter didn't really exist except in an abstract sort of way, and by consequence, neither did we. Jasper Fforde writes books that are a dream to read, and a nightmare to review, but here goes! It's been a long wait for this one - over two years since the last book was published - but his writing is always worth the wait. It's a standalone novel this time, set in a world of climate change but in reverse; and due to a scarcity of resources, most citizens hibernate through winter (eight weeks either side of the winter solstice). The reader isn't coddled by the author, either, which makes for a slightly confusing beginning. But piece by piece, we're given more glimpses into this world, and some of them are glorious. From the pressure-weapons creating patches of clarity when fired through falling snow, to the Villains, English nobility who escaped to Wales and refuse to compromise their standards, each supporting character and piece of knowledge is finely tuned and builds a truly comprehensive world. I enjoyed so much in this story. It may not be for everyone - it's slower in its pace than previous Fforde novels, and slower in allowing the reader to find their feet. But it was thoughtful and considered, and taking my time with it felt more like savouring than dawdling. If you've enjoyed previous books by Jasper Fforde, I'd recommend it in a heartbeat. And if you haven't, you're missing out - get thee to the Thursday Next series, post haste! Reading this book was like re-connecting with an old friend. The characters might be different and the setting new but the style and humour were undeniably Fforde. As always Fforde makes you feel right at home in the most improbable of settings, this time on an AU Earth at the start of the Ice Age like winter that Humans need to hibernate through. We follow Charlie (or Wonky as he is known to his annoyance) as he stays awake for his first Winter joining a small band of hardened people who stay a Reading this book was like re-connecting with an old friend. The characters might be different and the setting new but the style and humour were undeniably Fforde. As always Fforde makes you feel right at home in the most improbable of settings, this time on an AU Earth at the start of the Ice Age like winter that Humans need to hibernate through. We follow Charlie (or Wonky as he is known to his annoyance) as he stays awake for his first Winter joining a small band of hardened people who stay awake to ensure that others are looked after while they sleep. Charlie was a likeable character from the start and only got more so as the book progressed. A nice guy who tried to do his best but somehow always ended up way over his head. There were some nice subtle nods to Fforde's back catalogue with mentions going to gingham fabric and Caravaggio (I'm sure there are others that I missed but these ones stood out. Sadly no Dodo's this time though! A hugely fun read that I thoroughly recommend. Winter is coming and the population needs to get fed for a four month long hibernation. Set in a present day alternate reality in Wales, Charlie ‘Wonk’ Worthing is assisting with the Fat Thursday celebrations which are aimed at getting people up to a weight sufficient to sustain them throughout the Winter. His job is pretty lack-lustre but gives him access Morphenox, a drug which prevents dreaming (which uses valuable energy resources) and only has a one in two thousand chance of turning you int Winter is coming and the population needs to get fed for a four month long hibernation. Set in a present day alternate reality in Wales, Charlie ‘Wonk’ Worthing is assisting with the Fat Thursday celebrations which are aimed at getting people up to a weight sufficient to sustain them throughout the Winter. His job is pretty lack-lustre but gives him access Morphenox, a drug which prevents dreaming (which uses valuable energy resources) and only has a one in two thousand chance of turning you into a nightwalker (vacant, but alive). It’s also only available to the wealthy and those in certain types of employment. On a whim he applies for the job as Winter Consul which, if he gets it, will guarantee his continued access to Morphenox but he won’t be hibernating because the Consuls stay awake to ensure that things keep running while everyone else sleeps. Charlie himself doesn’t see the logic in his decision but that’s what happens when one is irritated with a current employer. Staying awake presents so much more than Charlie bargained for. Cannibalistic Nightwalkers, Villians, mythical WinterVolk, viral dreams and competing agencies are just some of the things that come his way. I’ve read nearly all of Fforde’s novels and I was ridiculously excited to get my hands on this one. While it was well-written, humorous, quirky and with a really clever plot, I found it to be slow going for 60% because it felt like all I was doing was separating the puzzle into edge pieces and colours (and a lot of them were white). After that the story kicks into gear and becomes the story I had hoped for all along. Fforde has a phenomenal skill for world-building filled with bizarre and unusual characters and even though this might not be my favourite book of his, it’s still a good read. "Winter isn't a season --- it's a calling." I first heard of author Jasper Fforde on Litsy (my favorite book app of all time) when tons of people had rave reviews for The Eyre Affair (the first novel in the Thursday Next series). I picked up a copy at the library and devoured the book, impressed with the overall originality and the humor! I don't read many books routinely placed in the sci-fi / fantasy genres but Fforde has a way of taking the weird and making it seem normal in a parallel unive "Winter isn't a season --- it's a calling." I first heard of author Jasper Fforde on Litsy (my favorite book app of all time) when tons of people had rave reviews for The Eyre Affair (the first novel in the Thursday Next series). I picked up a copy at the library and devoured the book, impressed with the overall originality and the humor! I don't read many books routinely placed in the sci-fi / fantasy genres but Fforde has a way of taking the weird and making it seem normal in a parallel universe sort of way. And the humor. Oh, the humor sells it if you're on the fence! I was thrilled to find that Fforde took a break from the Thursday Next and Shades of Grey series to write this standalone! In Early Riser we meet Charlie Worthing. She grew up in a Pool, raised by The Sisters of Perpetual Gestation (with names like Mother Fallopia, Sister Zygotia, and Sister Vulvolia) who took their pledge of procreation pretty seriously. After all, the population needs to stay strong and survive the winters. In this world, humans hibernate in the winter. A portion of the population is supplied by the company HiberTech with the drug Morphenox, allowing for a dreamless sleep. The problem is, some people on Morphenox don't fully wake up in the Spring - they turn in to 'nightwalkers', which are essentially zombies (they have cannibalistic tendencies if not given regular snacks). While most people hibernate dream-free through the winter, the guests on the ninth floor of a dormitory in Sector Twelve all begin dreaming the same dream about a blue Buick. When the dreamers begin to die, Charlie investigates the "viral dream" and it leads her straight to the doors of HiberTech. She has been on Morphenox since childhood so she's surprised when she suddenly begins dreaming about the blue Buick. When the dream becomes reality, Charlie questions her own sanity. Who can she trust in the Consul? Keeping the nightwalkers in line and avoiding villains isn't easy, her superior has split personalities (literally) so she can't seem to stay on her good side, and now she has to interpret a bizarre dream in order to make it through her first winter, though it could reveal dangerous secrets about HiberTech and the Morphenox most people depend on. 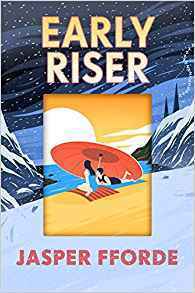 Fforde's signature style of compelling and quirky with a strong dose of humor shines in Early Riser! This is definitely the book I would recommend to readers who want to give sci-fi/fantasy a try and obviously those who are already huge fans of the genre and/or enjoy dystopias. Thanks to Viking and Edelweiss for providing me with a DRC in exchange for my honest review. Early Riser is scheduled for release in the United States on February 12, 2019. Confession: I have never been able to make it through a Jasper Fforde novel before this one. The Eyre Affair and the Thursday Next novels have always seemed way too randomly, relentlessly pun- and gag-stuffed, and frankly, I get more than enough of that at home over the dinner table. But Early Riser made me happy. It's a stand-alone, a fish-out-of-water story where a plucky, mostly self-aware young person goes out and finds adventure. The world he encounters has enough flexibility (and even occasi Confession: I have never been able to make it through a Jasper Fforde novel before this one. But Early Riser made me happy. It's a stand-alone, a fish-out-of-water story where a plucky, mostly self-aware young person goes out and finds adventure. The world he encounters has enough flexibility (and even occasionally unexpected kindnesses) to at least sometimes accommodate his inevitable mistakes. It's a post-apocalyptic glacier-locked earth, at least for half of the year, and most humans have adjusted by growing a thin coat of fur and hibernating through the winter months. Fforde has tremendous fun taking on numerous ripe targets: big pharma, marketing, sexism, the drudgery of menial labor, exploitation of the working class. The ingenious corporate meanies in Riser have worked out ways to squeeze work hours out of the public even as the public sleeps. The book's ultimately a kind of an arctic Wild West story set in Wales. With zombies. It's also a save-the-monster story, once they sort out which are the innocent monsters. Things get all cuddly and small-world interrelated by the end, but the earliest chapters reminded me of classic sci-fi like End of Eternity without the entrenched sexism. In an AU Wales, Novice Winter Consul Worthing is growing his wintercoat, trying to bulk up a bit, and preparing to spend his first Winter ever awake. He...mostly makes it and then promptly everything in Wales goes to hell. It is such a fun premise, and there were lots of cool things going on in the world but I'm not sure it all ever gelled for me. CONTENT WARNING: (no spoilers, just a list of topics) (view spoiler)[ loss of a loved one, cannibalism, missing limbs/body parts, medical experimentati In an AU Wales, Novice Winter Consul Worthing is growing his wintercoat, trying to bulk up a bit, and preparing to spend his first Winter ever awake. He...mostly makes it and then promptly everything in Wales goes to hell. It is such a fun premise, and there were lots of cool things going on in the world but I'm not sure it all ever gelled for me. -The world. It's sort of like "what if instead of global warming, we were heading into another Ice Age?" There are mammoths and saber tooth tigers! There's glaciers and dormitoria full of hibernating people! You can feel the cold sometimes! -The cast of characters. I guess this is a plus and a minus. None really stand out, but they're all very different and interesting. -Action packed. The first half was a lot of scene setting, the last half was pure action. Cliffhangers every chapter! Fiends! Robbers! The British! Stamp collecting! Zombies! It was a very quick read. -Some of the prose. There were a few parts when Fforde hit his stride that were beautifully written. I don't mean this with any shade whatsoever, but it was almost like they belonged in another book. Most of this book was a bit campy and light and then there were moments that were just stunning in their visual or emotive quality. -The Villain subplot. Totally unnecessary to this story and really took me out of the flow of things. -The gronk. What even is it? -The timeline. When is this taking place? We get all sorts of clues and each time I got a new one I was revised my estimate by a decade, which made a lot of previous things feel incongruous. Then of course there's the internal timeline too which was a bit helter skelter. -Internal consistency. There are about 5x too many zombies in this sector, given one of the statistics, and about 8x too many given the other statistic. Things that are common become scarce, things that are scarce are hidden in all sorts of dormitories, the cold that kills one person doesn't kill another...there's a lot of handwaving and demands that we just suspend our disbelief. As it wasn't a very serious book, this was okay but it nagged at me. It wouldn't have been more than a couple weeks of work to go through and plug up the plot holes. This felt very much like a thin idea that needed to bulk up for Winter and he figured it out as it went. -The knowledge distribution. Who knew what about which elements was...surprising. It didn't make sense to me that the characters who ended up being useful could be entirely taken at their word. -Narrative structure. I didn't care for the footnotes, which didn't add anything for me. The little passages at the beginning were a good way of avoiding infodump but also didn't feel to me like most of them had any bearing on what I was reading. -Summary ending. God, I just do not like this as the end of a story. As an epilogue? Sure, okay. But please, let the story come to rest naturally! The rest of the book had every detail spelled out, why would you only do the highlights for the end? I realize this is a me-thing more than a him-thing but bah! I just get so grouchy when my closure is given to me like a report rather than a story. Rachel I can’t do spoilers on IOS app.... but I have an idea! Allison Hurd Tell me in the spoiler thread! Eine Welt, in der die Eiszeit nie geendet hat. In der die Menschen sich angepasst haben und Winterschlaf halten. In dieser Welt spielt Jasper Ffordes Roman "Eiswelt" - ein Roman, den man am besten im Herbst oder Winter liest, unter der Bettdecke, während man sich wünscht, den Wecker ausstellen und selbst in den Winterschlaf fallen zu können. Ich habe die Geschichte (für meine Verhältnisse) in Rekordzeit gelesen. Tatsächlich ist sie wunderbar flüssig geschrieben, mäandert wie ein quicklebendiges F Eine Welt, in der die Eiszeit nie geendet hat. In der die Menschen sich angepasst haben und Winterschlaf halten. In dieser Welt spielt Jasper Ffordes Roman "Eiswelt" - ein Roman, den man am besten im Herbst oder Winter liest, unter der Bettdecke, während man sich wünscht, den Wecker ausstellen und selbst in den Winterschlaf fallen zu können. Ich habe die Geschichte (für meine Verhältnisse) in Rekordzeit gelesen. Tatsächlich ist sie wunderbar flüssig geschrieben, mäandert wie ein quicklebendiges Flüsschen von einem Schauplatz zum anderen. Der Hauptcharakter "Matschbirne" Charlie lässt sich großenteils einfach auf dem Fluss der Handlung treiben - dem Anspruch an einen Protagonisten, ein Handelnder zu sein, will er gar nicht gerecht werden. In dieser Hinsicht erinnert mich Charlie an Rincewind, den Zauberer aus Terry Pratchetts Scheibenwelt, dessen Hauptaufgabe oft auch eher im Weglaufen besteht. Und ja, der Roman begegnet den Härten des Winters mit typisch englischem Humor (obwohl er streng aus walisischer Perspektive geschrieben ist). Insgesamt würde ich "Eiswelt" aber nicht mit den Werken Terry Pratchetts oder Douglas Adams vergleichen wollen. Seine Stärken spielt das Setting immer dort aus, wo es unseren Erwartungen diametral entgegengesetzt ist: Den Bewohnern der Eiswelt geht es nicht darum, die schlanke Linie zu halten, sondern sich genügend Winterfett anzufuttern. Klimawandel spielt eine Rolle, aber nur insofern, als möglichst viel CO2 freigesetzt werden soll, um eine globale Erwärmung in Gang zu bringen. Neben den humorigen Seiten ist der Winter in Eiswelt aber auch brutal - Todesfälle und Nachtwandler genannte Quasi-Zombies gehören zum Alltag, und auch die Lebenden zeigen oft erstaunliche Physiognomien. An den sarkastischen Umgang mit den allgegenwärtigen Grausamkeiten des Winters muss man sich als Leser gewöhnen. Die Charaktere werden nicht gerade subtil gezeichnet - aber meist steckt zumindest mehr hinter ihrer Fassade, als der Roman zuerst preisgibt - und harte Winter sind auch keine Umgebung, in der subtile Eigenschaften gut gedeihen würden. Trotzdem war ich irritiert, wie kommentarlos der Ich-Erzähler über Faustschläge aufs Auge und Zombiebisse hinweggeht - der körperliche Schmerz wird kaum beschrieben. Auch an anderen Stellen, etwa beim Tod einer alten Bekannten, kam mir die Gefühlsebene zu kurz. Wer mag, kann sich an Steampunk-Elementen wie Gaslaternen, Phonographenwalzen und Druckluftwaffen erfreuen. Allerdings werden auch LED-Lichter erwähnt, Cary Grant und die gesamte Palette moderner Kalorienbomben wie Snickers, Nutella und Cadbury's Trauben-Nuss-Schokolade. Insgesamt hinterlässt der Weltenbau (mit Ausnahme der genau beschriebenen Waffen) leider einen etwas verworrenen Eindruck. Die Handlung ist im Großen und Ganzen logisch, auch wenn es durchaus fragliche Elemente gibt. Wie sich beispielsweise das außergewöhnliche Verhältnis von Toccata zu Aurora in der Praxis genau gestalten soll, darüber denkt man besser nicht zu genau nach. Trotz der kritischen Anmerkungen hat mich das Buch absolut gefesselt. Nicht zuletzt, weil es zu allem, was es andeutet, dann auch liefert. Jedes Gewehr, das vorkommt, wird auch abgefeuert. Meine Empfehlung: Einfach lesen, solange es kalt ist. An interesting idea, though why telling it should take 16 hours when it could easily be done in half is beyond me. I wanted to love this, as I love the rest of Jasper Fforde's books, but I struggled a bit. It has his usual clever cultural twists and references to familiar things out of context (Rick Astley makes an appearance here), but doesn't always explain them - for some reason children are brought up in a Pool, which is never properly explained, as if he forgot to go back to the explanation. Set in an alternative reality where people hibernate through Winter (which is much harsher), and take drugs to gi I wanted to love this, as I love the rest of Jasper Fforde's books, but I struggled a bit. It has his usual clever cultural twists and references to familiar things out of context (Rick Astley makes an appearance here), but doesn't always explain them - for some reason children are brought up in a Pool, which is never properly explained, as if he forgot to go back to the explanation. Set in an alternative reality where people hibernate through Winter (which is much harsher), and take drugs to give them dreamless sleep. Only a few people stay awake, including dangerous Villains, security, the shadowy pharmaceutical firm who manufacture the drugs and the Consuls, who make sure things run smoothly despite the hazards of the Wintervolk. Charlie joins the Consuls and finds himself involved in a viral dream, which has much more to it than it originally appears, plus looking after those who never fully wake up from hibernation. There's a good story in there, and the usual Fforde range of characters but it was a little drowned out by the world-building, just slightly too much information to digest to try and make sense of it all whilst still following the story, as if Fforde got a bit carried away. I am a big fan of Jasper Fforde and look forward to all of his books, but this one fell far short of my (admittedly high) expectations. It started out murky: the reader is expected to just understand the world’s rules without much explanation. I found that I had to re-read the first few chapters because I was so confused, and that has never happened to me with Fforde. I have read all of his books and expect some twisty weirdness, but after 200+ pages it still felt like all weirdness, no plot. By I am a big fan of Jasper Fforde and look forward to all of his books, but this one fell far short of my (admittedly high) expectations. It started out murky: the reader is expected to just understand the world’s rules without much explanation. I found that I had to re-read the first few chapters because I was so confused, and that has never happened to me with Fforde. I have read all of his books and expect some twisty weirdness, but after 200+ pages it still felt like all weirdness, no plot. By the time anything started to happen I was too exhausted to really care about the ending. Clever and original, as Fforde always is, this just isn’t holding my attention enough to make me stay with it until the end. It might have worked better as a short story or as a novella. As Miss Jean Brodie would have said, ‘For those that like that sort of thing, that is the sort of thing they like.’ It’s just not for me. With thanks to NetGalley and Hodder & Stoughton for a free review copy. This is my first novel by Fforde - and it certainly won't be my last. The witty prose is perfectly down my alley. I was giggling ever so often, even though some of the topics in this book aren't funny at all. Jasper Fforde has a wonderful way with characters and their peculiarities (and there are an awful lot of them). Somehow he manages to make every one of them likeable - in a special kind of way. It took me some time to wrap my brain around the fact that I'm reading a story set in an AU Wales a This is my first novel by Fforde - and it certainly won't be my last. It took me some time to wrap my brain around the fact that I'm reading a story set in an AU Wales and not in a future dystopian Wales. But once this insight was obtained I had a lot of fun with the crazy, yet consequential worldbuilding. The first half of the book has a slow pace, it introduces the world where hibernation is in order, and explains the inherent problems and institutions. The second half accelerates the pace and dives into a conflict where it isn't always clear who's on whose side - or which sides even exist. I absolutely loved the Thursday Next novels. They are probably one of my most favorite things to read...ever. And the premise of this one was incredibly interesting—people who hibernated during the winter (much like bears), and the few who stayed awake to guard them. Pseudo-zombies, politics and wild dreams are involved, which is definitely something that should bowl me over. And yet...there's something about the writing that just had me disinterested. Perhaps it's because I'm going through a bit of a slump right now (I've already DNF'd one book and decided to not read another), but I'm not feeling this one. Maybe later, I'll pick it back up again and try to continue. But right now, it's a no from me. It's... Alright. It is very similar to Shades of Grey which is a shame as it only highlights how it's not Shades of Grey (which you should absolutely, definitely read). The story is typical of Fforde, with its bizarre worldbuilding, throwaway references (again with the megafauna!) and complete obliviousness of the characters to how strange their world is. Early Riser posits an Earth locked in near-perpetual Winter, in which the entire human race hibernates through the sixteen weeks the world is drowned in snow and ice. All except for the few who stay awake, some out of moral principle, some out of contrariness, and some because it's their job. Charlie Worthing is new to that job, and is immediately out of his depth when he encounters a nightwalker--someone who failed to wake from hibernation and is now brain-dead, exhibiting only a few tics of human behavior--and gets tangled up in the woman's fate. There's a lot of over-the-top wackiness and some great reversals of character that I did not see coming. It's one of the more unusual zombie books out there, I think, the more so because the zombies are not an environmental hazard, but are central to the book's theme of human nature and dignity. My one complaint is that in structure and in the nature of its main character, Early Riser treads the same ground that Fforde's earlier novel Shades of Grey did: there's the weirdly dystopian society, a mystery pertaining to a shadowy government entity, a somewhat clueless hero, and an abrasive heroine. Fforde does a good job making the two distinct--reading Shades of Grey didn't make me capable of sussing out the secret of Early Riser--but there's enough of a sameness that I couldn't quite love it on first reading. I suspect more readings will raise my rating. Overall, though, I found the characters compelling and was attached enough to the secondary characters that Worthing's solution at the end was moving. This was definitely a book worth waiting for, and I don't even resent it for not being the sequel to Shades of Grey. I have no idea how many other of Fforde's fans are somewhat impatiently chewing the furniture waiting for that one, but I maintain my hope that he'll someday get around to it. Complex plot, Ffordean snark, interesting characters. Perhaps too much worldbuilding, perhaps too much handwaving on the dreams. Overall, I often felt I was in a Charles Stross (hmm, another Charlie) Laundry book. The plot rolled out well, except for a few too many "whatever you do, don't X" making X inevitable. (a) did Fforde really never specify main-Charlie's gender? (b) Fodder's big reveal seemed to generate no more than "oh yeah, huh?" (c ) Charlie's facial situat Complex plot, Ffordean snark, interesting characters. By the way, (d) didn't work for me. I'm good with the other wacky-but-implausible, but for me this was too much of a stretch. On the whole, it's good to have JF back. Early Riser is a cross between a classic B sci-fi-horror movie, and Scooby-Doo mystery. I don't say that as an insult! It's actually a lot of fun, though I kind of expected one plot arc to end in a reveal of Old Mrs. Whatshername as the Ghost of Sector Twelve. I very much enjoyed the campy humour of the dialogue and pop culture references. It might not be for everyone, but if you can look past the logic holes in the world building, Early Riser is an entertaining romp! To escape from St Granata’s and continue to have access to the non-dream drug Morphenox, Charlie Worthing takes a job with the Winter Consuls. The Winter Consuls are responsible for the safety of the human population who hibernate to escape the frigid temperatures during the winter months and who must be protected from the Villains, Nightwalkers, and WinterVolk, in order to wake up safely in the Spring. Charlie’s first assignment takes him into the peculiar Sector Twelve to deliver a Nightwalker To escape from St Granata’s and continue to have access to the non-dream drug Morphenox, Charlie Worthing takes a job with the Winter Consuls. The Winter Consuls are responsible for the safety of the human population who hibernate to escape the frigid temperatures during the winter months and who must be protected from the Villains, Nightwalkers, and WinterVolk, in order to wake up safely in the Spring. Charlie’s first assignment takes him into the peculiar Sector Twelve to deliver a Nightwalker to the Consulate there and investigate the rumors of viral dreaming with his mentor, Jack Logan. Unfortunately, Logan is soon killed, and Charlie becomes stranded in Sector Twelve as mysterious things start to happen. As some of the viral dreamers begin to die, Charlie is unsure about who he can trust, and then he starts to dream. Early Riser is Jasper Fforde’s first book in several years, and I think it was worth the wait, although it is not quite as good as some of the books in his Thursday Next series (but perhaps better than a few.) To me, reading this book was similar to meeting a good friend that I hadn’t seen in a few years; I enjoyed the book and slipped into the writing style effortlessly. In the beginning, I felt shades of Game of Thrones north of the wall meets Never Let Me Go meets Inception, but soon realized this is its own unique world. Fforde is so very detailed in his world-building, even creating advertisements found in the back of the book for promotions by governmental entities, handbooks for fictional quotations for each chapter’s epigraph, and “Hibernatory sponsors” for the website. It is clear that he thinks and cares deeply about each world that he gives life, and he makes me care about his world and his characters, as well. Even more details about the worlds of his books can be found on his website, jasperfforde.com. I’m waiting not so patiently for the “Deleted Scenes” from Early Riser, which will be “Live after USA tour.” I believe Fforde’s humor is decidedly British so not everyone will be appreciative, but I enjoyed it immensely. This is a SF novel. It can be nominated for this year Hugo. The story is about a civilization, which on the surface is quite close to the present day Wales with a twist: during winters, temperature drops to -50 degrees Celsius (-58 F), so 99% of population hibernates. The hibernation is a risky business – if you have not enough fat or wake up too early, you’ll probably die, as well as in many other circumstances. There is a wander drug, which solves the problem: Morphinox. It trades absence of dr This is a SF novel. It can be nominated for this year Hugo. The story is about a civilization, which on the surface is quite close to the present day Wales with a twist: during winters, temperature drops to -50 degrees Celsius (-58 F), so 99% of population hibernates. The hibernation is a risky business – if you have not enough fat or wake up too early, you’ll probably die, as well as in many other circumstances. There is a wander drug, which solves the problem: Morphinox. It trades absence of dreams (which waste body’s energy) for stable sleep. Another drawback is that one in 2000 users will wake up ‘dead’ – zombie like, able to walk, feed and sometimes perform other simple functions (muscle memory). While the 99% sleep, 1% protect their sleep, one of the protectors’ group are the Winter Consuls. The protagonist, young woman Charlie Worthing, with a facial deformity, joins the Winter Consuls for her first winter. The Winter Consuls are a peculiar bunch, with a lot of sociopaths and people, who don’t fit in a society. A light funny read, even despite a lot of supportive characters die like flies.